I think I may have heard the term “blue roof” before last Saturday, but I must not have paid attention. 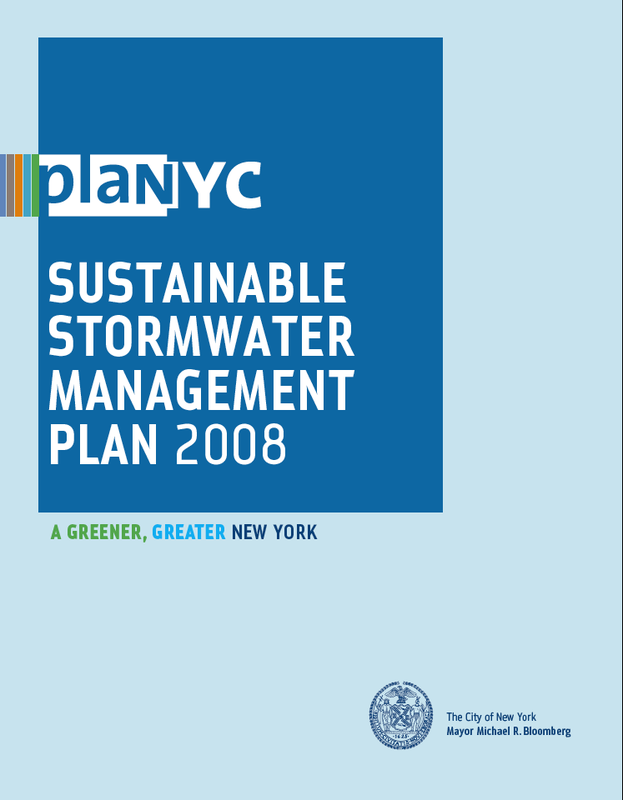 I was fascinated as I read New York City’s NYC Stormwater Sustainability Report 2008. It included a full description of a blue roof as an LID measure. I checked out few other leads to find this LID technique also being explored in Washington state and a recent article in EDC Magazine discussing it as well. Bottom line: a blue roof detains water on the roof of a structure in order to reduce the stormwater impacts. The detention is done through a flow restriction device around the roof drain which slowly releases the water or, in the Washington modeling, all of the rainwater on the rooftop is collected and stored. The roof-harvested water can used to fill a water cistern for irrigation, a site infiltration system like a bioswale or rain garden or discharged slowly to the storm system. The blue roof is best suited to a large flat roof in more urban areas with limited availability of ground level detention. There are also designs which provide wide “gutters” near the perimeter of the roof to concentrate the water roof load where it can be supported structurally. If the primary goal is stormwater reduction, then a blue roof can achieve that goal at considerably less cost than a vegetated green roof. The estimates I found ranged from $1/s.f. to $4/s.f. for a blue roof while estimates for an extensive green roof might be $18-25/s.f. Blue roofs also don’t have the same maintenance costs of green roof either – they basically require the same maintenance as a conventional roof..
Of course, the blue roof doesn’t provide the multi-benefit that green roofs do (such as energy use reduction, habitat, aesthetic, life cycle roof cost), but 2008 modeling conducted by Douglas Beyerlein, PE, Clear Creek Solutions in Mill Creek Washington does show the blue roof slightly outperforming the green roof for stormwater reduction. Greetings Kim & Brian: I have been following your blog for several months with great interest. Thanks for sticking with this and publishing such good stories. I’d like to cite your blog in a paper I’m developing for the APA – do you have a preferred citation? Marita Roos ASLA.